November 11. Remembrance Day here in Canada. Our church service this morning honoured those who gave their lives in service to their country. After lunch, it seemed like a good idea to go for a walk. The sun shone weakly and intermittently and my chair by the fire was very attractive. I left it reluctantly. However, once outdoors, the crisp air and a brisk 10 km walk got my endorphins working. For the first half hour I wished for gloves as the wind was chilly coming off the water of Elk/Beaver Lake, but I did warm up. Dull leaves litter the ground. A few still fall, lazily drifting back and forth, before being caught by ground hugging bushes and suspended. 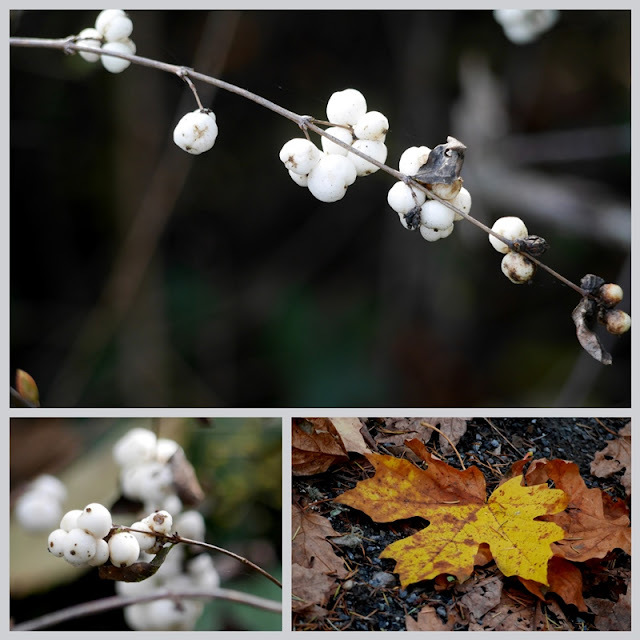 Snow berries (Symphoricarpos Albus) are the brightest plants in the wood these days. Leaves of various shades float on the dark water among the rushes. The other day I read a funny article about How NOT to Hygge. The author begins "It's been two years of listening to people not from Scandinavia tell us what Hygge is - and what it is not." Now I discover that there are more Scandinavian words that will, no doubt, be embraced by those who...don't really understand them...including myself. That said, today has felt very hygge-ish (my own new word), what with embracing the outdoors and getting cozy in front of a fire. I feel quite virtuous after that long walk and am settling down to some stitching and television viewing. Tomorrow is a statutory holiday in lieu of Remembrance Day, so we can sleep in and have another day at home. I do love Sunday evenings when Monday is a holiday. Surely the scent of freshly baked bread contributes to hygge, too. I prepared the dough yesterday (all sourdough, no yeast) and let the loaves slowly rise in the fridge overnight. Around noon I pulled them out and they rose some more in the oven with the pilot light on. That loaf on the right has now had one crust sliced off, while warm, and devoured savored. I'm afraid I completely forgot about my sourdough starter that has been waiting for me while I was traveling. I should have fed it as soon as I got home. Your appealing loaves reminded me, and I am going this minute to fetch the jar and start a sponge to be baked this week!! A very good day judging from your photos and simple pleasures of a leisurely day. That bread calls to me. Happy new week to you. It was strongly impressed upon us all here today how important it was that we should remember that it was not only our countrymen that lost their lives in the Great War, but also those of many other countries around the world too. Lucky you to have a free Monday, no such luck here - enjoy the day not forgetting your sleep in too. I think smelling and tasting that warm bread would be all the hygge I'd need! Sounds like a weekend to fill the senses! Enjoy your day off! The bread looks delicious, I love your embroidering, and the walk sounds just thing to do on a day when we have so much to reflect and be thankful for. Have a lovely week. I LOVE D to see the Snow berries. We have the same kind day in Japan as well; it sure is important to remember the people who dedicated their lives for the country. How wonderful to have freshly baked bread♧♧♧　Sure is something I need to do for the hygiene!!! Thank you SO much for your sweet visits. We also recognise Rememberance Day here in Australia. At the 11th hour on the 11th day of the 11th month most Australians hold a minutes silence and events are held at war memorials around the country. It is lovely watching your home move into the colours of Autumn as we jump into Spring! Have loved your descriptions and today I especially appreciated the falling leaves description. You “take us there.” Course, I prefer to be by your fire sniffing freshly baked bread, but the 10km hike was pleasant as well. Missed my gloves, though! Hello, today is our official Veterans Day. I am thankful and proud of my family members who have served in the military. Love the beautiful lake views and images. Looks like a lovely spot for a walk. The bread looks delicious. Happy Monday, enjoy your day! Have a great new week! We too celebrated Remembrance day in church. Lastly anyone who has family in military presently stand. Almost everyone in congrgation was standing by the end. It was the great visual of the sacrifice given by our men and women in the last 100 years. Also mention were the families that also bore the sacrifices as their son's, daughter's wife,husband children,and siblings served. It really touched my heart as a Canadian. My grandmother saw 3 son's go off to war and 1 who didn't return..
On a lighter note : Wow, a casual mention your walk was 10km. Impressive 5km is more than enough for this gal. It sounds like a wonderful day! That bread looks really good too. Thank you so much for a good laughter! The pronunciation tips were so hilarious! Well, we are funny people, we Scandinavians :) I know Swedish, don’t understand a word of Danish or Norwegian - but I just have to read that text another time! So good you went for a walk and found so many beautiful little things to enlighten our MM. That walk sounds wonderful although a tad too far to be comfortable for Gerard. Its a joy to be able to join you on yours and take in the sights. Lorrie, Wow a 10km walk is a good one. The bread looks delicious. Thanks for sharing and have a great week. Sylvia D.
I firmly believe I could devour and savor at the same time. That bread looks so good. You took a long walk for a cold day! And it was a beautiful one.... We were watching an English mystery last night (Netflix) and the word hygge was used ... Bill was totally bewildered! When i explained,, he said it is no wonder that I am having trouble choosing the exactly right new pieces we need for our new home. Homemade bread is my weakness...since I can't eat desserts! I don't make it often because I over eat! lol I did buy buttermilk today though to make some quick breads. LOVE those snow berries! They remind me of doll's eyes, which are odd to see in the woods on NC. I'll look at your links. I still don't know how to pronounce hygge! lol Hugs! Your pictures are most wonderful. I love your day of hygge. It definitely portrays the image of cozy with the beautiful walk, embroidery, home made bread. I'm fortunate that a Remembrance Day ceremony is held at my work. Because Nov 11th fell on the weekend, the ceremony was held on Friday. The cooling temperatures and shorter days have me going into hibernation mode too. Bring on the hygge! Lorrie - I love so much about this post - I can relate to the urge to linger on the couch, but the days that we can get out and about are numbered! We have snow berries, too, and they catch my eye when I am wandering the woods. Your picture with the leaves among the rushes is my favorite - the water almost looks thick … and makes for a very intriguing picture. OK, I might have lied - I am hankering for a piece of that bread, still warm from the oven - so THAT might be my new favorite! Thanks for adding some "yeast" to Mosaic Monday this week! I am always so impressed with your beautiful surroundings. It is so interesting that even though you are north of us, that judging from your flowers and trees, the weather must be much more moderate. Everything is still so beautiful and your photos tell the story well. Hygge, ‘To appreciate the moment you are in while you are in it’.Works for me. Dear Lorrie - You had such a nice day full of “hygee” moments with various different activities. All sound so peaceful. We can’t take the peace for granted, the peace brought by the sacrifices of the brave past people, and can’t let their toils and blood fade meaninglessly away. Your needlework is lovely. I didn’t know sourdough. Have happy days ahead. Lovely photos! Thanks for sharing your walk. Now that looks a lovely walk, and I enjoyed it through your photographs. Beautiful fall photos. Love the color and the water. The break looks delicious, I can just taste a warm slice of it with butter spread on top. Remembering is always good... to beloved people, to special moments and events. Hygge-ish is a funny new word, I like it. Hygge is in my eyes a individuelly things and of course a question of mentality. Your Sunday sounds like our Sundays these days. Relaxing. We walk, we visit mom and we eat simple and read or watch TV and it's an especially good feeling if Monday is a holiday. Lorrie, From the first sentence to the last, and all the gorgeous photos in between, it's been a joy to visit. I am intrigued by the piece you are stitching. Wonderful colours. Glad you had that extra day to savour and hibernate, after that long 'virtuous' hike.